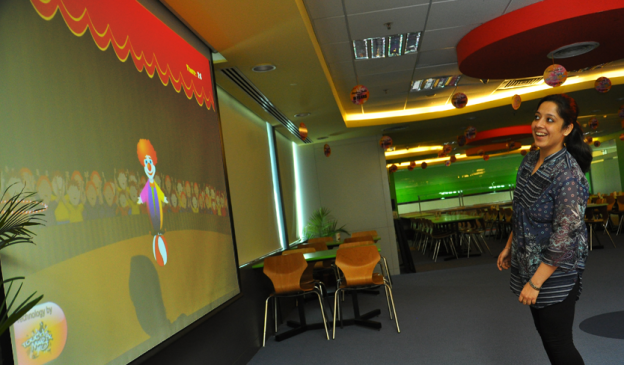 Greater employee engagement and enthusiastic participation with MotionMagix™. Brief: We are all moving towards a world that is hyper connected. So when a company that prides itself in offering differentiated experiences in their IT Services offering decides to have an internal team building exercise, it can be nothing else other than hi tech while offering an elevated employee engagement experience. To achieve this Amdocs asked TouchMagix to make use of our Corporate Engagement Game Pack. Amdocs felt that interactivity during such employee events was a necessary since physical activity and relevant corporate team building exercises needed to be amalgamated in a fun and engaging manner. 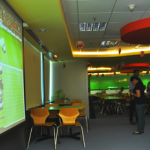 The MotionMagix™ Interactive Wall was installed in their cafeterias – 3 in Delhi and 1 in Pune. 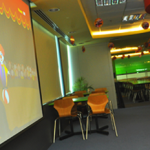 10 specially designed games targeting the corporate audience were used in these events. Along with the regular football and tennis games to check the participants’ physical agility, there were special games tailored for the company to promote a sense of camaraderie and team work between employees. The unusual mix of games generated a great sense of interest amongst the employees and ensured enthusiastic participation making this team building exercise a great success. Impact: The agenda for this meet was to promote greater employee engagement during the internal team building activity. The interactive games were not only effective in ensuring that the participants had fun but also helped in engaging and generating a wider employee interest in the exercise. 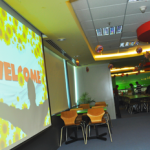 This entry was posted in Corporate and Industrial, Entertainment, Event and Media, MagixTouch and tagged Amdocs, interactive wall, MotionMagix Interactive Wall on May 6, 2014 by Touchmagix.